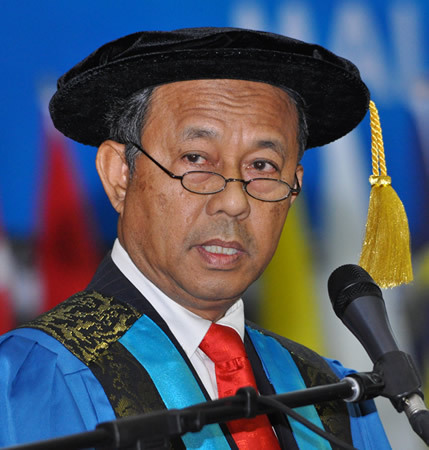 BANGI, 28 Oct 2013 – One of the country’s leading economists, Tan Sri Dr Sulaiman Mahboob has been awarded an honorary degree of Doctor of Philosophy (Business Management) at the 41st Convocation of The National University of Malaysia (UKM) here today. Sulaiman, 65, who has retired from government service, was appointed non-executive Chairman of the Malaysian Investment Development Authority(MIDA). He is also Chairman of Jambatan Kedua Sdn Bhd (JKSB), the second Penang bridge. 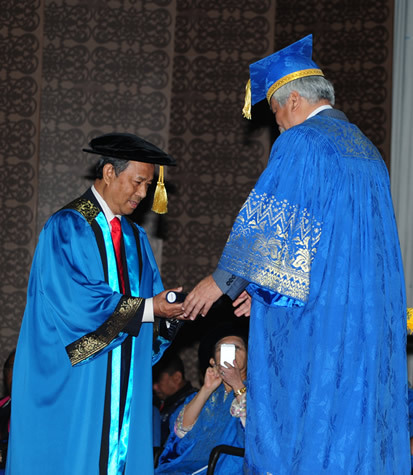 In his citation, Deputy Vice-Chancellor (Academic and International Affairs) Prof Datuk Dr Noor Azlan Ghazali said the former civil servant had made a major contribution to the National Economic Action Council (NEAC) in efforts to overcome the 1997 Asian economic crisis. Sulaiman was appointed Head of the NEAC Secretariat in 1998 for his expertise and skills as well as his extensive experience in economic management. He later moved to the Ministry of Domestic Trade and Consumer Affairs as Secretary General in 2001 and in 2006 was appointed as Director General of the Economic Planning Unit until his retirement in June 2009. Despite his retirement, Sulaiman continued to serve in a number of agencies, including MIDA and several public universities. He also held the position of Executive Director at the Malaysian Institute of Economic Research (MIER), an independent economic policy think-tank. Sulaiman in his response said the process of economic development and management should also ensure that the quality of the environment is not compromised to ensure long-term sustainable economic and social growth. He reasoned that economic growth which is not sensitive to environmental issues – is not real growth as economic growth should be enjoyed by all through a more even distribution of benefits. He expressed confidence that policy-makers had been successful in their economic plans through better income distribution.